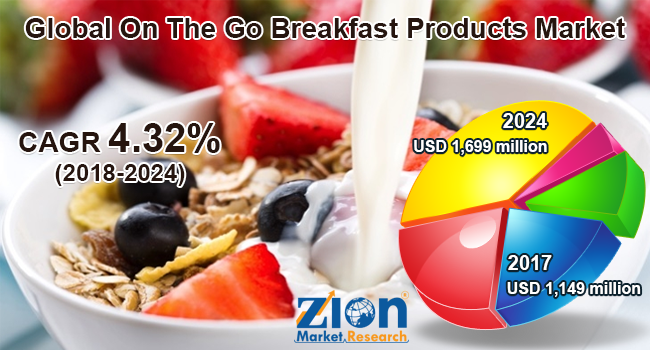 Zion Market Research has published a new report titled “On The Go Breakfast Products Market By Product (Cereal Meals, Breakfast Bars, Sandwiches and Burgers, Bakery Products, Sausages and Salamis, Egg Meals, Beverages, and Others), By Packaging (Films & Wraps, Pouches & Sachets, Rigid Boxes, Bottles and Jars, Cans, and Trays), and By Distribution Channels (Hypermarket/Supermarket, Convenience Store, Specialty Store, and E-Commerce): Global Industry Perspective, Comprehensive Analysis, and Forecast, 2017 – 2024”. According to the report, the global on the go breakfast products market was valued at around USD 1,149 million in 2017 and is expected to reach approximately USD 1,699 million by 2024, growing at a CAGR of around 4.32% between 2018 and 2024. The on the go breakfast products market is anticipated witness a significant growth rate during the forecast period. Changing lifestyle patterns, food habits, and busy work schedules of people globally are anticipated to fuel the expansion of on the go breakfast products market globally. Increasing consumer awareness about the benefits of on the go breakfast products is positively affecting the on the go breakfast products market. Due to the fact that healthy breakfast restores blood glucose levels in the body to normal. An empty stomach in the morning increases stress levels and fatigue and decreases concentration levels. In addition, some dietitians recommend having a light breakfast before workouts. Moreover, a substantial urban population does not have enough time for breakfast, which, in turn, leads to the increased demand for on the go breakfast products across the globe. Based on the type, the on the go breakfast products market is divided into sandwiches and burgers, bakery products, egg meals, beverages, sausages and salamis, breakfast bars, cereal meals, and others. In terms of revenue, the cereal meals segment accounted for a significant market share in 2017. On the basis of packaging, the on the go breakfast products market is classified into pouches and sachets, films and wraps, cans, rigid boxes, trays, and bottles and jars. Based on distribution channels, this market is categorized into hypermarket/supermarket, convenience store, specialty store, and e-commerce. In terms of revenue, the e-commerce distribution channel is anticipated to show a significant escalation rate in the near future, owing to rapid digitization, e-commerce, and internet penetration. North America held a significant market share in 2017 and is anticipated to dominate on the go breakfast products market during the forecast period. This market growth is due to the increasing demand for on the go breakfast products. Significantly large working population and high purchasing power are anticipated to fuel the development of on the go breakfast products market in the near future. The Asia Pacific region is anticipated to show a significant growth rate in on the go breakfast products, owing to increasing working population, high adoption of western lifestyle, and growing population in the region. China, Japan, and India are the major contributors to the on the go breakfast products market in the Asia Pacific region. Europe is projected to show a considerable growth rate, owing to the increasing importance of high nutritive breakfast products. In addition, growing functional advancement in on the go breakfast products is anticipated to further boost this market’s growth. Latin America is projected to show insignificant growth due to a preference for traditional breakfast food. The Middle East and Africa on the go breakfast products market are anticipated show relatively slow growth in the global market during the forecast period. Leading on the go breakfast products market players globally accounted for a significant market share in 2017. Some key players have been focusing on novel product launches, research, and development, enhancing nutritional value, and eco-friendly packaging, in order to retain their market dominance. Some key players are Sanitarium Health & Wellbeing Company, Alara Wholefoods Ltd., General Mills, Amy’s Kitchen, Baggrys India Ltd., Country Choice, Kelloggs, Nestle, Nature’s Path, Raisio, Uncle Tobys, Weetabix, MOMA, and Quaker Oats Company, among others.